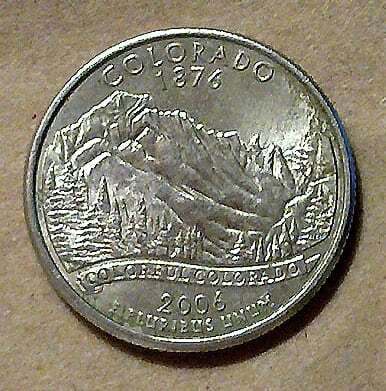 The 2006 Colorado quarter is a beautiful coin featuring a design of the Colorado Rocky Mountains on the reverse (tails side) of the quarter. But did you know some Colorado quarters have errors that are worth a lot more than just 25 cents? It’s true. In fact, some are worth $10 to $50 — or more! There are several kinds of Colorado quarter errors and varieties. But the most well-known of these are so-called cud errors — they’re worth a lot of money. What is a die cud? And why is this unusual-looking error coin worth so much? A die cud occurs when a dent forms near the rim on the coin’s die — which strikes the design on the planchet (the blank piece of metal that becomes a coin). Small die cuds may look like a little tag of metal attached to (and the same height as) the coin’s rim. Large die cuds may eclipse a significant chunk of the design. How Much Are Colorado State Quarter Errors Worth? 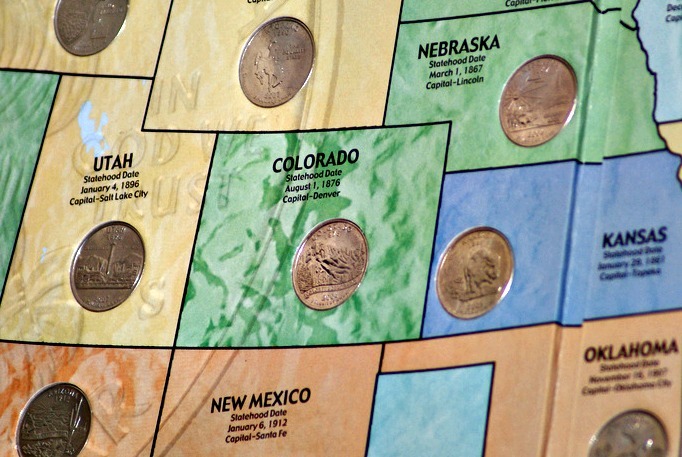 The value of these Colorado error coins depends on the size and location of the error. Generally speaking, the larger the cud or die break and the more of the design either obscures, the more the coin is worth. Many of the 2006 Colorado quarter cud and die break errors are worth $10 to $20. Some have even higher values and are trading for $25 to $50… or more! The 2006 Colorado quarter was part of the very popular 50 State Quarters program. More than a half billion Colorado state quarters were made among the various United States Mint facilities. While these state quarters might be fun to collect, most Colorado quarters that you find in pocket change will have some degree of wear and, therefore, be worth only face value (25 cents). However, if you happen to have any uncirculated Colorado quarters, proof Colorado quarters that were struck for collectors, or Colorado quarters that have some type of error or other oddity, then they will be worth much more! As stated earlier, Colorado quarters with errors are worth anywhere from $10 to $50… or more. The obverse of the Colorado quarter features George Washington. This design is seen on the obverse (heads side) of all 50 State Quarters struck from 1999 through 2008. John Flanagan originally designed the Washington quarter in 1932. In 1999, the portrait of the first president was updated for the 50 State Quarters — with modifications by William Cousins. The reverse of the Colorado quarter depicts the Rocky Mountains and evergreen trees with the motto “Colorful Colorado” across the bottom of the design. The reverse (tails side) was designed by Norman E. Nemeth. Colorado became a state on August 1, 1876 and is named for the Colorado River — or Rio Colorado, as so named by Spanish explorers. The state’s nickname is “The Centennial State” because Colorado was founded a century after the Declaration of Independence was chartered in 1776. The Denver Mint in Colorado was established in 1897 and struck its first coin in 1906. Colorado Springs, a city about 60 miles south of Denver, serves as the headquarters of the American Numismatic Association (ANA) — one of the world’s largest coin clubs! The Colorado silver boom of the late 19th century fueled a huge increase in the production of Morgan silver dollars during the last decades of the 1800s.